Johnny Storm, the designated hot-shot heart-throb of the Fantastic Four, is known for having a few romantic relationships over the years. Some are long-lasting while others, fleeting. Then there are his workplace connections that turn into unbreakable bonds. Let’s take a look back at his long-term loves and romantic dalliances, his friendships and end with an unexpected love. When Johnny Storm was a teenager, Dorrie Evans was his main squeeze. His life as a Super Hero disrupted their dates and left her behind, so she wasn’t too impressed that he was the Human Torch. She demanded that he give up his costumed heroics for a day to save their relationship though it ended poorly when she was attacked by the Torch’s old foe, the Beetle. Unimpressed and annoyed with his duties, she began dating other people. 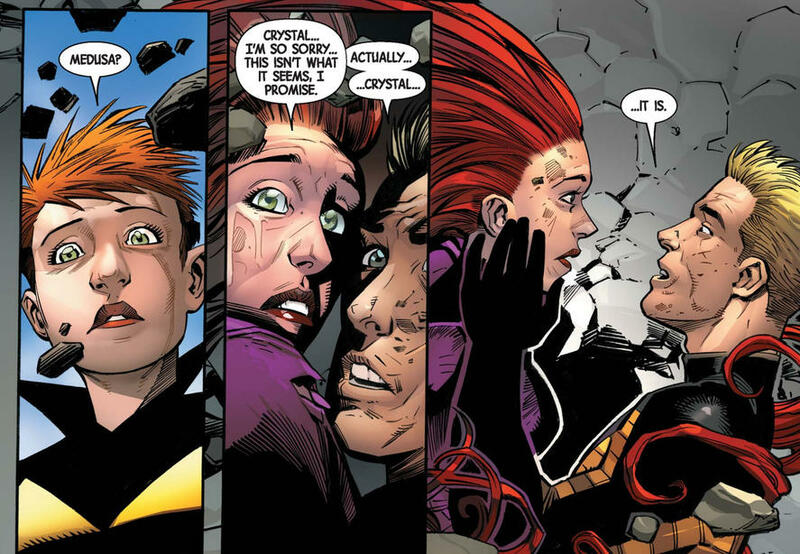 When Johnny met the Inhuman Crystal, he became instantly smitten. During their serious relationship they spoke about marriage, but a few things hindered their idyllic dream. Crystal’s Royal Family drama drew her back home to Attilan, and Johnny’s sometimes hot-headed nature also pushed her away. When she became ill from Earth’s pollutants, she left for Attilan and when Johnny didn’t join her, she thought he didn’t love her. She quickly met Quicksilver and a romance between them led to marriage. 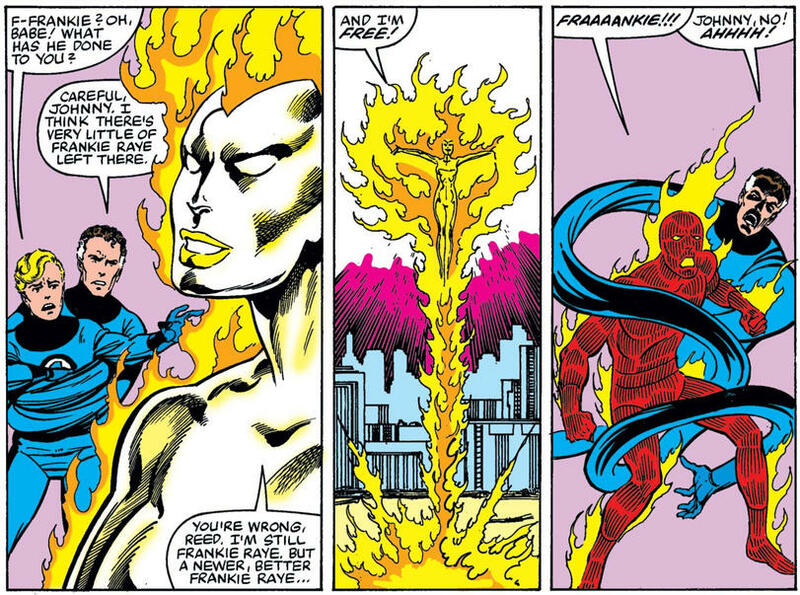 Frankie Raye, aka Nova, and Johnny had much in common, they both had the ability to envelop their bodies in flames. As such, they became embroiled in a romantic relationship while Johnny taught her how to use her powers since they were new to her when the met. Their relationship however fizzled out when she sacrificed herself to save Earth and become Galactus’ herald. When Johnny encountered a native of Battleworld, Zsaji, he fell in love though it was probably more of a physical attraction than anything else. But with Johnny, you never know. Zsaji returns his affections but gives him up for Colossus. 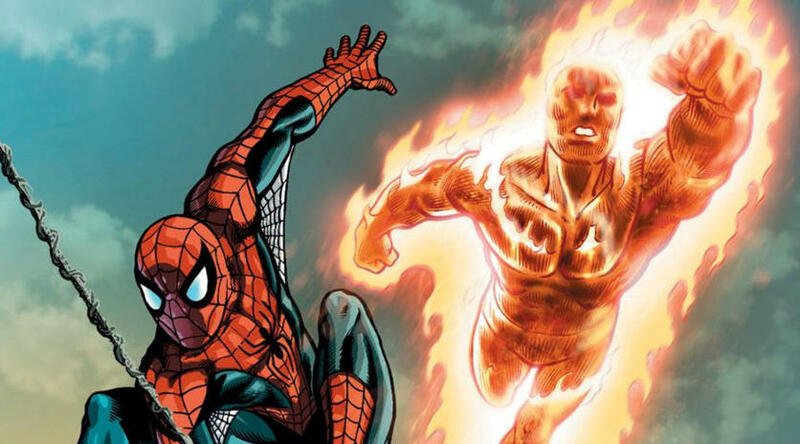 The Skrull soldier Lyja was directed to infiltrate the Fantastic Four as their trusted friend, Alicia Masters. But in the process, she fell for Johnny and ended up marrying him in disguise. Eventually her ruse was exposed and she became Johnny’s estranged wife. Johnny’s relationship with Medusa, once public, caused a lot of friction. When Johnny’s former flame and Medusa’s sister Crystal found out about their hidden dalliance, it caused tension between the three, so Medusa and Johnny decided to call it quits out of respect. While a fleeting love, it’s one worth recognizing because it stemmed from Johnny’s need to have a support system after the Fantastic Four disbanded, post Secret Wars. Kourtney Keaton, supermodel and a self-proclaimed “frenemy” to Johnny, she was also his on- and off-again girlfriend. While they seem to have a comfortable relationship, Kourtney breaks up with him for superficial reasons. Occasionally, Johnny teams up with Peter Parker, aka Spider-Man but it takes some time before they become a dynamic duo. First, they both end up saving each other from Super Villains, to their mutual dismay, and then they become best friends. We’re talking the kind that insult each other though share a mutual respect at the same time. 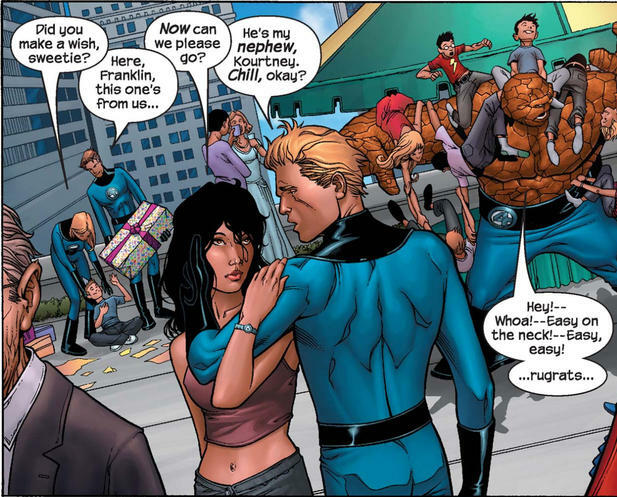 They are so close that when Johnny apparently dies, he requests that Spider-Man take his place on the Fantastic Four, showing that he sees him as family and trusts him implicitly. 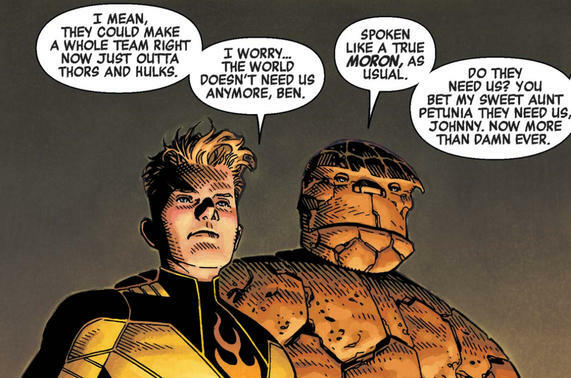 Ben Grimm, aka the Thing, is Johnny’s closest friend. While Johnny spars with the grumbling Grimm, their bond is special, like brothers from another mother. They always look out for each other and engage in playful, albeit sometimes un-friendly, banter. The Thing is a true friend when he puts his feelings aside after his former love Alicia Masters and Johnny become engaged, and agrees to be the best man at their wedding. While we’ve been focusing on his relationships with organic life forms, we think it’s important to note that Johnny has another love: auto repair. He started tinkering with cars in high school and becoming a skilled mechanic; he later modifies Reed Richards’ designs on the Fantasti-car. Johnny also turns to fixing cars to fix himself post breakups, especially after the Thing is apparently killed in a battle against Doctor Doom. Whether it’s his relationships with women, his brotherly co-workers or cars, it’s clear that Johnny’s burning passion for companionship comes in many forms.